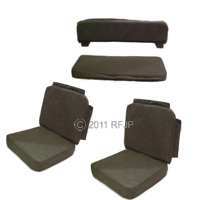 not qualify for "Free Shipping"
Drivers Seat & Passenger Seat back panel - 3 machine screws along each edge flap (1” in down from the top, 1” up from the bottom and the 3rd screw centered on the length of the flap. All are equal distant to the center line of the flap (about ½” in from the edge), 4 machine screws along the top edge flap (1” in from each end and the middle 2 screws equally spaced) (again about ½” in from the edge of the flap). Rear bottom seat cushion has 5 screws in the front flap – each end has a screw 1” in from the end, 1 in the dead center and then the final 2 equally spaced between the dead center one and the 1” in from the end screw. (again about ½” in from the edge of the flap). Rear upper seat cushion has 5 screws in the front flap – each end has a screw 1” in from the end, 1 in the dead center and then the final 2 equally spaced between the dead center one and the 1” in from the end screw. (again about ½” in from the edge of the flap). It also has 1 screw in each of the flaps (one on each side) that are fastened to the back of the seat frame (screw should be dead center on the flap). The machine bolts and finish washers are used to hold the passenger and driver bottom seat cushion to the rear part of the seat frame.